Our next example will examine the concept of "double bending". This essentially means that we will be bending two notes one right after another. In this Larry Carlton style example, we will be focusing on this concept with a whole step bend, followed by a minor third bend. The key to playing this successfully is to make sure you pick the first bend, but not the second. This accounts for a smooth flow in your playing. 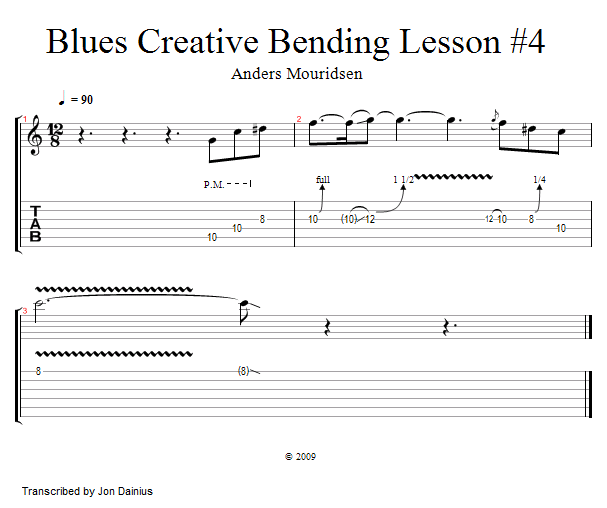 Let's try this example with our backing track, playing a 12 bar blues.